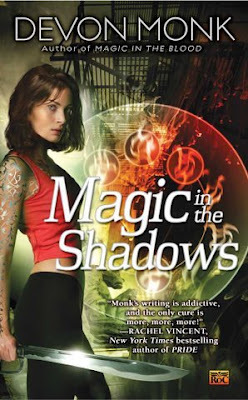 On her blog Devon Monk provides a sneak preview of the cover for her third book in the Allie Beckstrom series, Magic in the Shadows, due for release in November. The second book, Magic in the Blood is only a few weeks away - May 5th! A nice style to the whole series. This is making me LMAO ATM. I have been stalking her blog for any hint of another cover and figures I would skip THE day she put it up. 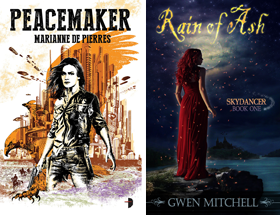 I agree that all the covers have a nice style, especially when seen together. The first book was one of my top reads for '08 and I cannot wait for the 2nd! Honest KMont I wasn't trying to scoop you (bwahaha). Just a compulsive Google Reader! Magic to the Bone was on my list too. No, no beef at all, dude. Just excited to see the cover! If only we had an EASY button for readers, like Staples has for office supplies. Honestly, who needs an EASY office supply button? Pfffftttt. Meant to say I'd use my EASY button for evol and obtain Monk's upcoming releases that way. Durn, totally ruined the evol effect by double posting! KMont no 'evol' here just mildly demented. We do need some book minions to carry out dastardly ARC retrievals.